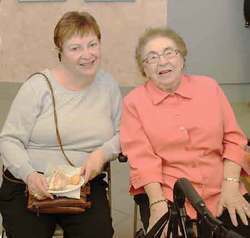 Over the years, feeling of compassion for others has been very evident at the Wetaskiwin Hospital. The new donor recognition system is one way the Wetaskiwin Health Foundation and Hospital staff thank donors. The recognition system showcases and honors the accumulative donation levels reached by companies, businesses, service clubs and individuals. The Wetaskiwin Health Foundation takes on a $325,000 challenge to fund a Family Room in Long Term Care.“By supporting the construction of a Family Room in Long Term care you are contributing to the quality of life for our Residents and their families. A Family Room for confidential conversations and private moments between family members will now be available to our Long Term Care Residents. This priority reflects the ongoing support and development of the Wetaskiwin Hospital and Care Centre as an outstanding community hospital. As the Phase I fundraiser and project nears completion, the Foundation will begin a campaign for Phase II, Palliative Suite for Long Term Care. There is an ever increasing number of deserving causes seeking financial support in Wetaskiwin. The Wetaskiwin Health Foundation sincerely appreciates the generosity of this community as reflected by the new donor recognition system. They are honored by the trust donors have placed in them throughout the years. The Foundation continually strives to make certain the gifts are used to directly benefit the individuals and families. To accomplish this, the Foundation continues to manage donations in any of several designated accounts and track the donation from time of arrival until utilized to strengthen healthcare.